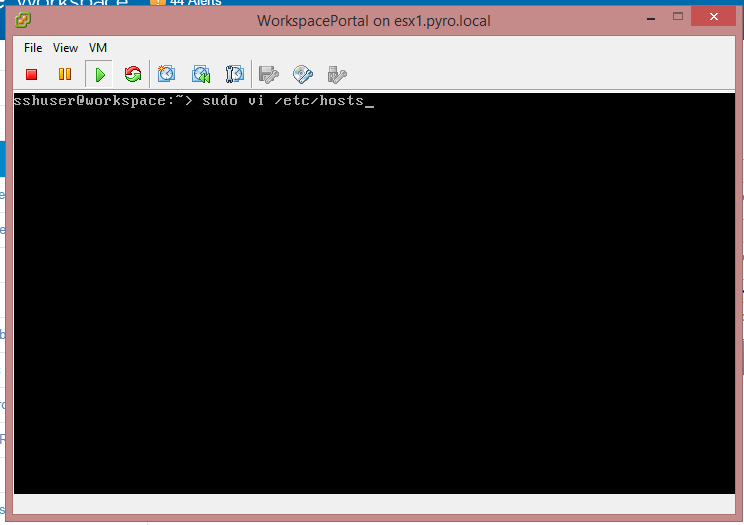 Turns out that if you join Horizon Workspace to the AD domain which uses a different URL namespace such as “pyro.local” than what you’d actually publish, such as “workspace.pyro.com” you actually have to modify the local hosts file of the appliance otherwise you’ll end up in an endless loop of frustration like I was for the past several hours. The worst part is that the config saves just fine, but now authentication no longer works, leaving you puzzled and sad. Just goes to show you, read the release notes. Hopefully this helps someone faster than google did previously for me. When joining the AD domain, you’ll get this. Which is fine, except people on the outside can’t resolve that address. Now it’s off to the vi to add us a hosts entry. I had to login as sshuser then sudo to root. For those of you not fluent with the VI text editor, which is myself included, just hit I to insert, type what you need to type then hit escape to stop inserting text. After you do that hit ZZ to save and write the changes to the file. Lo and behold! You can resolve your external address and you don’t have a sad loop. It’s a Christmas miracle. What a rawr.